LES AMBASSADEURS-LES AMBASSADEURS DU MOTEL DE BAMAKO. As the seventies unfolded, the Rail Band de Bamako were kings of Malian music. They had dragged Malian music kicking and screaming into the twentieth century. The Rail Band de Bamako had given traditional Malian music a makeover. However, another group was about to steal their crown, Les Ambassadeurs. Stern Africa recently released a double-album of Les Ambassadeurs’ music. This includes their two albums Les Ambassadeurs du Motel De Bamako. These two albums feature the first appearance of a legend of African music, Salif Keifa. He would play an important part in the Les Ambassadeurs’ story. Les Ambassadeurs comprised members of several West African bands. Many members of Les Ambassadeurs had previously, been a members of the Ivory Coast band, Les Elephants Noirs Of Bouke. That was until 1968. Then the military junta came to power in Mali. Lieutenant Tiekoro Bagayoko was one of the most powerful men within the military junta. In the evenings, he liked nothing better than to head to Ousmane Makolou’s Motel De Bamako. That was where he went to unwind and meet visiting dignitaries. He couldn’t have picked a better location. Motel De Bamako sat on the banks of the river Niger, under the shade of mango trees. There was only one thing missing, his own band. In the Buffet Hotel, which was adjacent to the city’s central station, the Rail Band played every night. They were lead by Malian saxophonist Mousa “Vieux” Sissoko. Joining him in the Rail Band were Guinean trumpeter Kabine “Tagus” Traore and singer Ousmane Dia, of the Star Band de Dakar. With such a star studded lineup, it’s no surprise the Rail Band were crowned kings of Malian music. Lieutenant Tiekoro Bagayoko wanted his own equivalent of the Star Band. Usually, what he wanted, he got. In 1972, Lieutenant Tiekoro Bagayoko decided to put together his own band. His first “recruit” was Guinean guitarist Kante Manfila. He became the bandleader. That was partly, down to his musical pedigree and partly, down to his background. Kante Manfila had been a member of the Unite Jazz and Independence Jazz in the Ivory Coast. He was also the scion of a leading Manding family. More importantly, Kante was an innovative musicians and bandleader who commanded respect. Joining Kante were some equally talented musicians. This included guitarist Issa Gnare, drummer Djosse, balafon player organist Idrissa Soumaoro and balafon player Kaba Kante. Along with Kante Manfila was Les Ambassadeurs was born. Les Ambassadeurs would prove one of the most versatile West African bands. They didn’t stick rigidly to one style of music. Their raison d’être was to entertain, and entertain they did. Seamlessly, the switched between Afro-beat, Afro-Cubam, blues, jazz, pop and R&B. If needed, they could turn their hand to French, Russian and Chinese music. Whatever the audience wanted, they got. At one time, people were bringing in music for Les Ambassadeurs to hear. They’d then go away and learn how to play it. It seemed that Les Ambassadeurs realised the importance of entertaining their audience and pleasing their patron Lieutenant Tiekoro Bagayoko. He was pleased with his new band’s progress. However, the missing piece in the musical jigsaw joined Les Ambassadeurs in 1973. His name was Salif Keita. He was invited to join Les Ambassadeurs in 1973. Salif was a member of Les Ambassadeurs’ biggest rival the Rail Band. This would be a coup for Les Ambassadeurs, poaching one of their main rival’s most talented members. Les Ambassadeurs pulled of this musical coup de tat, and Salif Keita became their latest recruit. Having joined Les Ambassadeurs, Salif Keita began to learn his new bands way of doing things. Practice began at 10am and lasted right through until 2pm. This prepared Les Ambassadeurs for their evening engagement. They were consummate professionals. For Salif, a young singer who previously, had been wanting to change direction, this was akin to an apprenticeship. Previously, Salif has been singing traditional songs. This was too restrictive. He wanted and needed to change direction. Salif wanted to sing more modern music. When he joined Les Ambassadeurs he was able to sing songs about what it was like living in Mali in the seventies. Straight away, Salif flourished. Salif didn’t take time to settle. Thrust into the limelight he shawn. What helped was that he wasn’t Les Ambassadeurs’ only singer. No. There were three other singers. Each had their speciality. Beidy Sacky sung the Afro-Cuban songs, Ousmane Dia sung Wolof songs and Moussa Doumbia was an R&B singer. The only thing Les Ambassadeurs didn’t have was someone who sung Malian folk songs. That was where Salif came in. He was able to sing Malian folks songs. This included new ones written by Kante Manfila. Salif also wrote a few songs. Sitting drumming his guitar, Salif penned his songs. Just like Kante’s songs, they were full of social and political comment. Inspiration for songs came from Sekou Toure, the President of Guinea. He was one of Africa’s modernisers. With Kante originally from Guinea and Kalif a Malian, this combination made for potent and successful musical partnership. When Les Ambassadeurs took to the stage, Salif and the rest of Les Ambassadeurs became one. Kante’s guitar playing was at the heart of the band’s sound. So was Salif’s vocal. He soon became one of the most important members of Les Ambassadeurs. His vocals were captivating. Les Ambassadeurs were on their way to becoming kings of Malian music. During their journey to the top of Malian music, Les Ambassadeurs added three more members. This included two guitarists Ousmane Kouyate and Amadou Bagayoko. They were joined by multi- instrumentalist Kelitigui Diabate. Little did anyone know it, but this would be the classic lineup of Les Ambassadeurs. In 1974, the rivalry between Les Ambassadeurs and the Rail Band was at its peak. So, like two gunslingers, Les Ambassadeurs and the Rail Band took to the stage at the largest stadium in Bamako. There was only ever going to be one winner, Les Ambassadeurs. Stealing the show was a series of vocal masterclasses from Salif. What should’ve been Les Ambassadeurs’ finest hour was overshadowed. Not long after this, the junta took tighter control of Mail. For Les Ambassadeurs this wasn’t good. Their songs were full of social comment. They could’ve been perceived as an enemy of the state. Despite this, Les Ambassadeurs decided to record their debut single. Les Ambassadeurs were now billed as Kante Manfila and Les Ambassadeurs, when they headed to the recording studio for the first time. Their first single was Ambassadeur. It became Les Ambassadeurs’ best known track. Some would say it was their theme tune. Salif made his debut on the B-Side Mana Mana. This was the first of five singles released between 1975 and 1976. After Ambassadeur, Bolola Sanou (Golden Jewellery), Seranfing (Payday), Nagana and Tie Columba (Columba) were released. With each single, Les Ambassadeurs’ popularity grew. They were one of the biggest bands in Mali, if not Africa. Les Ambassadeurs travelled not just throughout Mali, but overseas. So it made sense to record their debut album. Disc One-Les Ambassadeurs du Motel De Bemako. In 1976, Les Ambassadeurs were chosen to be one of the Malian representatives at the Festival Of Arts and Crafts, in Lagos, Nigeria. This was just one of the many trips abroad Les Ambassadeurs made. France, Burkina Faso and Guinea were all regular venues for Les Ambassadeurs. With each visit, Les Ambassadeurs’ reputation grew. So, they needed an album to spread the word about Les Ambassadeurs’ music. This was Les Ambassadeurs du Motel De Bamako. On the album cover, there’s no sign of Salif Keita. He makes his present felt throughout the Les Ambassadeurs du Motel De Bamako. Salif takes He also takes charge of the lead vocal on each of the ten tracks. This includes the singles Bolola Sanou. Nagana and Saranfing. Then on Djoula, which was the B-Side to Nagana, Salif delivers a vocal masterclass. Singing in the Soninke dialect, his vocal is impassioned and compelling. This was Salif Keita’s introduction to the wider world. Little did anyone know he would become one of the legends of African music. However, Les Ambassadeurs are no one man band. Each member of Les Ambassadeurs makes their presence felt. The music is a melting pot of genres and influences. Afro-beat, avant garde, funk, jazz and soul. Then there’s Wolof, Malian and Guinean music. Love songs and ballads sit side-by-side with songs of praise and devotion. Some songs were understated, others dramatic. The lyrics are similarly eclectic. Some lyrics are full of social comment. Others songs about love and war. Every member of Les Ambassadeurs contributes something to the band’s greater good. While Salif may be the star of Les Ambassadeurs, he couldn’t exist in isolation. He needs the rest of Les Ambassadeurs as they seamlessly, combine musical genres and influences during this rhythmic and vocal tour de force. The result was one of the finest debut albums by a Malian band. Quite simply, Les Ambassadeurs du Motel De Bamako. It’s a compelling and captivating musical journey. During this musical journey, Les Ambassadeurs sound like the experienced and talented band they are. Many people thought they had a great future ahead of them. However, the political conditions worsened. Despite the worsening conditions, Les Ambassadeurs headed back into the recording studio. They recorded two more albums. While this might have seemed selfish to the Malian people suffering at the hands of the junta. It wasn’t. Les Ambassadeurs were giving a voice to the Malian people. Their problems and circumstances were heard by the wider world. Tracks from these two albums, Les Ambassadeurs Du Motel De Bamako Volume One and Two feature on disc two. 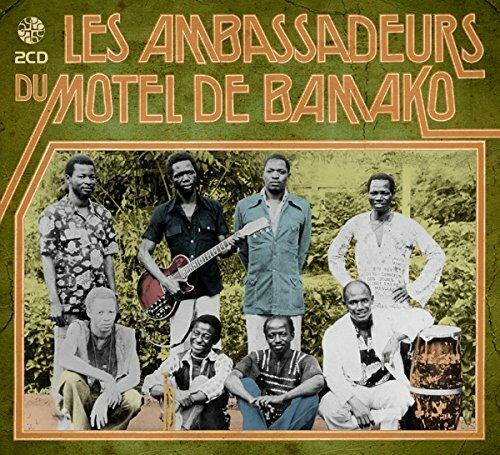 Disc Two-Les Ambassadeurs du Motel De Bamako. A total of nine track feature on disc one. They’re a mixture of singles, album tracks and two tracks from a radio broadcast. It’s more a compilation than a fully fledged album. This isn’t a criticism, merely an observation. During the nine tracks we hear different sides to Les Ambassadeurs. Just like their debut album, Les Ambassadeurs du Motel De Bamako is suitably eclectic. Unlike their debut album, the vocal changes hands throughout the album. Salif Keita, Idrissa Soumaoro, Ousmane Dia and Kante Manfila all take charge of the vocals. This works, and works well. The music veers between understated and laid-back, to rousing and uplifting. Highlights include Mali Denou, which features Mail’s lead vocal and the Wolof song Ray M’bote, which features a heartfelt vocal from Ousmane Dia. Then there’s Ambassadeur, which is Les Ambassadeurs ‘ anthem. Ousmane Dia returns on Fatema These four tracks showcase Les Ambassadeurs at the peak of their powers. They could’ve and should’ve dominated Malian music for a long time. Sadly, that wasn’t the case. Mali was hit by strikes during 1977. The country was brought to its knees. Malian military dictator Moussa Traore decided enough was enough. He decided to imprison many members of the junta and their supporters. This included Lieutenant Tiekoro Bagayoko. For Les Ambassadeurs, this wasn’t good news. Lieutenant Tiekoro Bagayoko had always looked out for Les Ambassadeurs. With him in prison, they were vulnerable. Many of Les Ambassadeurs decided to stay in the Ivory Coast. Then most of Les Ambassadeurs headed for Adidjan. This was a place where artists and musicians felt safe. However, some members of Les Ambassadeurs missed home. They decided to head home to Bamako. For Les Ambassadeurs, this marked the end of the original lineup. Over the next few years, the lineup of Les Ambassadeurs changed. They released further singles and albums. However, Les Ambassadeurs du Motel De Bamako and then Les Ambassadeurs Du Motel De Bamako Volume One and Two feature Les Ambassadeurs at their best. They were about to embark upon a great musical adventure. Anything seemed possible. The future looked bright for Les Ambassadeurs. Their star was in the ascendancy for several years. Just about anything looked possible. Sadly, as is often the case Les Ambassadeurs never fulfilled their potential. The political climate changed and Les Ambassadeurs were forced into exile. At least one of Les Ambassadeurs was able to fulfill their potential. That was Salif Keifa. He became one of the legends of African music. Salif Keifa enjoyed the critical acclaim and commercial success that Les Ambassadeurs could’ve and should’ve enjoyed. A reminder of Les Ambassadeurs’ music is Les Ambassadeurs du Motel De Bamako, which was recently released by Stern Africa. ← ROBYN HITCHCOCK-THE MAN UPSTAIRS.